Hello and welcome to a brand new week at Wonder Kids, This week I have some amazing fun food ideas that are great as movie snacks or if you have a little fussy eater I think making the food fun can really help. Some of these would also work as party food too. We have dozens of great recipe ideas at Wonder Kids, you can find them all in our great Kids Kitchen section. These are delicious and healthy and super easy, here we go. Whilst the rice is cooking, cut the bell peppers in half lengthwise and remove all stems and seeds. Now prep the tofu. I love tofu because it absorbs any flavour you add to it but you need to prep it correctly. Slice the block in half length ways. Wrap each half in a towel and place something heavy on top of it like cast iron pan or some books. This will squeeze the water out of the tofu. You'll need to leave it for at least 15 minutes. making sure you change the towels if they get too wet. A lot of water will come out. We do this so that the texture of the Tofu is really tasty once cooked. If you skip this it will be like eating warm jelly. yuk. Steam the bell pepper halves, I prefer to use a tiered bamboo steamer for this but you could use a microwave too. Creating the turtle - fill four bell pepper halves with the rice mixture. Cut the other four halves into long strips, this makes 4 heads and 16 turtle legs. On each of the four stuffed peppers insert one strip to make Crush's head and four pepper strips to make crush's legs. Add two raisins to each head to make Crush's eyes and enjoy. For the slaw, combine all the ingredients in a large bowl and mix together. This slaw can keep in the fridge for up top 3 days, just make sure you cover it. Cook hotdogs on packet instructions, once cooked, make seven slices lengthwise in each hotdog. These need to go two thirds of the way up the hotdog to make the tentacles. Now use the English mustard to add a face to each one. To serve, place a small amount of slaw on a plate a top with the Hankfurter. Enjoy. Lets finish this with one more recipe, these have been super fun so far so how about a tropical, summer drink as the perfect accompaniment to go with them. If you love cooking and want to get the kids in the kitchen than make sure you check out the Kids Kitchen before you go anywhere. Combine everything in a pitcher, if it's a tad too sharp then you can add a pinch of sugar but less is more. Pour into glasses over ice. I like the extra touch of adding a fish. 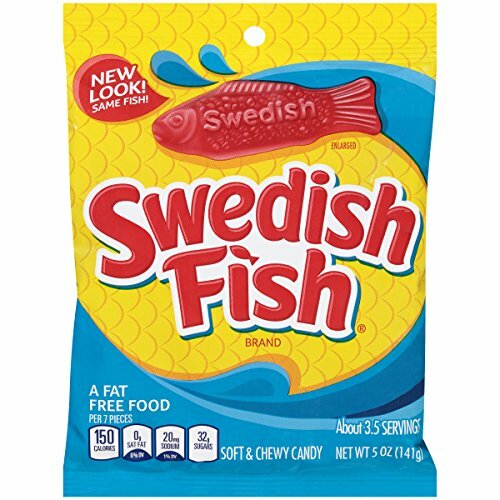 This is an American candy called Swedish fish but you can find them in the UK, so In have included a link below to save you some time.